Education is universally recognized as one of the most fundamental building blocks for human development and poverty reduction. When given the opportunity to learn, people are empowered to contribute fully to the development of their lives, their communities, and their countries. Our schools require support from the community and other organizations to maximize their impact on the minds of our children. In this day, some schools still lack the necessary resources to provide an equitable and accessible learning environment to all children regardless of race, ethnicity, and socio-economic status. More so, many young adults are unable to attend a higher education institution or further their extracurricular talents due to prohibitive educational costs. Academic and extracurricular success not only builds the self-esteem of children, but also ensures that they have the ability to maximize all the opportunities available to them in this world. 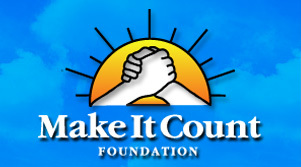 Make It Count will provide scholarships to young scholars and gifted youth who have not only shown promise in an academic or extracurricular capacity, but who also would otherwise lack access to further growth without this necessary financial assistance. Find out about BACKPACKS FOR EDUCATION program and SCHOLARSHIPS and the work we have been doing in the NEWS.